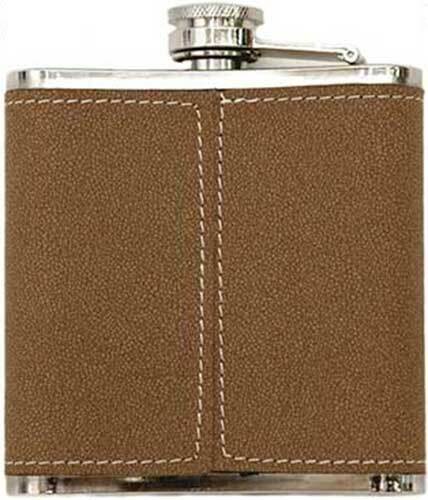 Irish coat of arms flask features leather wrapped over stainless steel. When you select a name that requires an apostrophe, such as O’Shea, from the drop down menu, you will notice that the apostrophe has been omitted. Do not worry; the selected name will be spelled correctly on the Irish coat of arms flask with the apostrophe included when required. The Irish Gift House can accommodate differences in spelling within the family name; just let us know your correct spelling by sending us an email or making a notation in the comment area on the check out page. 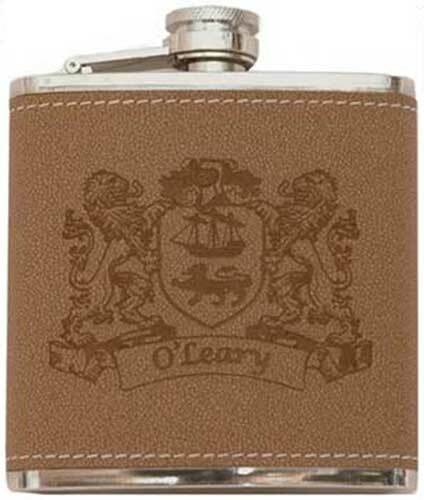 This Irish coat of arms flask features a high-quality, six ounce, stainless steel construction wrapped in a soft textured leather that features your laser engraved Irish family surname and authentic Irish coat of arms. The Irish flask is made in the United States; you may choose from over 900 different Irish coat of arms. The stainless steel Irish coat of arms flask is a special order item that ships directly from our supplier; please allow 2 weeks for delivery. Pewter Irish flask is a hip style that features the Trinity knot. Irish flask features your coat of arms along with shot cups and a funnel. Irish coat of arms gift set includes the leather wrapped flask and stainless steel funnel. Irish coat of arms flask features stainless steel construction.